With it’s fixed 65mm f5.6 Fujinon EBC lens, full manual control and no meter, the Fuji GSW690iii is about as basic as a ‘serious’ camera can be. 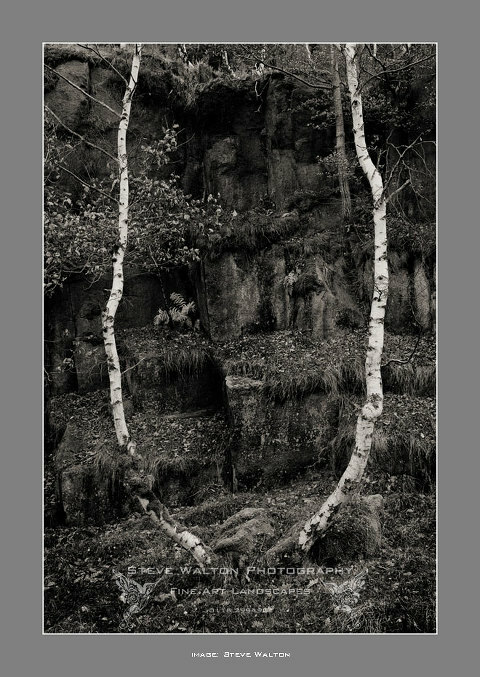 You could argue that using the GSW690iii is almost a return to pure and simple disciplines that force the user to be a photographer rather than a button pusher, a measurer of light rather than a hoper for the best. It makes you plan ahead. It’s quirky and idiosyncratic, occasionally infuriating but always satisfying to use within it’s remit. It’s a camera that is more than capable of creating images of great depth and immense quality, due to the size of the frame and quality of the lens. It’s an unfair comparison when made to 35mm, it shares the same 3:2 aspect ratio and not much else, images from the Fuji are on a different scale in every way. The camera is big, not pretty, and built solely for creating photographs. To get the best from such a basic fixed lens camera like this means knowing that you really do have a use for it. As long as I continue to use enough film to justify keeping the Fuji GSW690iii I will continue to use it. Perhaps not every day, but it is used frequently and it is the one and only camera that persuaded me to offload an entire Mamiya 7ii outfit because I prefer the Fuji and I prefer it’s results. The quirks are mainly with the lack of a ‘Bulb’ setting on the shutter, it is restricted to ‘T’ only. That means when the exposure has been timed out the shutter has to be closed by turning the shutter ring on the lens (it’s a diaphragm shutter) off of the ‘T’ setting to a timed setting, such as 1 sec as it is the next closest on the ring. Not a huge problem, but it is more fiddly than using a ‘Bulb’ setting when the shutter will close immediately a cable release has been unlocked. The other frustration comes from being unable to use the Lee, or similar, filter system. This is due to the sliding lens hood that, when retracted as it must be to accommodate the Lee Filters holder, prevents access to the shutter and aperture rings on the lens. You have the choice of either physically removing the lens hood from the lens altogether, which results in destroying it completely, or using screw-in circular filters, which usually means duplicating some of your existing square filters. I duplicate, many amputate. The fixed 65mm lens (roughly equivalent to 28mm in 35mm terms) of the GSW690iii is very sharp and Velvia 50 frames are rich and saturated without being over contrasty. The viewfinder is not the best, it is adequate, but the rangefinder patch is very small and not very bright, although mine has remained accurate for many years without need for correction. It is on the far left of the camera body, which is fine for right-eyed photographers but not so good for spectacle-wearing left hookers with big noses. The GSW690iii frame lines are to be taken with a pinch of salt, but they do move during focusing to help a little with parallax error. There are two shutter releases, one is threaded for a standard cable release and is in the conventional position on the top plate. The other is not threaded and is on the front of the body and is surrounded by the shutter release lock. The wind-on lever takes two strokes to advance the frame and on my camera, frame spacing has always remained consistent. There is a hot shoe on the top and an x synch port on the front, hidden by a plastic sliding cover. On the top plate above the viewfinder eyepiece, there is a small bubble level for lateral alignment, to the right of the hot shoe is a lockable selector for 4, 8 & 16 exposures according to the length of the film loaded in the camera. This really only now applies to 8 exposures on a 120 film as the other two options are no longer available from most film manufacturers. To the right of that is the frame counter. There is a release catch on the side of the camera to open the back for film loading and removal. Focus, aperture and shutter are all controlled by rings on the lens. The aperture and shutter rings can be turned in unison to preserve an ev setting, a la Zeiss Hasselblad and the rubber-covered focus ring is firm but precise and unlikely to slip beyond it’s setting of it’s own accord. This camera likes big hands and a purposeful photographer. On the base plate is a standard 1/4″ tripod socket and the ‘odometer’ which counts the number of actuations x10. This means if the counter is showing 300, then it has recorded 3000 actuations. A shutter service is advised at 5000 actuations. 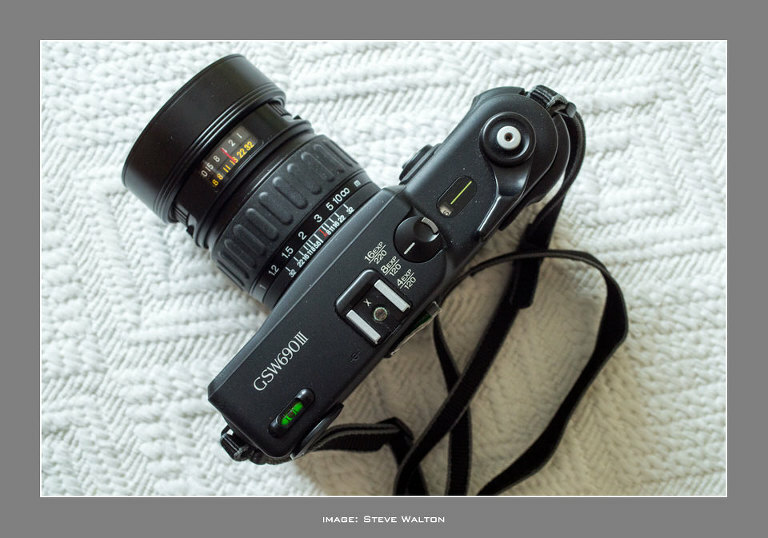 One criticism of the GSW690iii and other Fuji rangefinder cameras is that they have a loud shutter. This is not so, the shutter is almost silent, it is the odometer which produces a loud, metallic clunk as the shutter is tripped. The leaf shutter runs from ‘T’ to 1/500th sec. and the apertures are from f5.6 to f32 with half-stop increments. The aperture setting detents are very positive with an audible click as they are set. There is a third strap lug on the left side of the body to allow the GSW690iii to be carried vertically, if preferred. Build quality is robust, the camera has a complete plastic covering which has proven to be very durable in the 20 years I have owned mine. There are no chips or cracks despite spending a lot of time in a backpack with camping gear and other equipment on top of it. The GSW690iii is a big camera, but no bigger or heavier than many flagship models by Nikon or Canon when fitted with a prime lens. All the major controls are big enough to operate whilst wearing gloves with the exception of the lock for the back, which is recessed and requires glove removal to access when changing films. This is my main irritation with the camera. The recess was clearly designed for the fingers of a five year old and maddeningly difficult to push the tip of a frozen cold finger into to gain enough purchase to flick the lock open. I have worn out the finger ends of thin gloves on this thing and invariably resort to using a car key to prise the lock open. This could be a contributing factor to a lost-key disaster. I have nightmares about getting back to the car after a 3am start for the top of Scafell Pike, only to find I’ve dropped my keys by the summit cairn during the euphoria of finally getting the lock open. It hasn’t happened yet. But it could do! Overall, the GSW690iii is a very likeable and dependable camera and mine has outlived around £17000 worth of digital Nikon dslr equipment that I’ve owned and sold on in the time I’ve had GSW. It just keeps on doing what it was made to do. It makes a great choice as a landscape and travel camera for those who are committed and still use film. It’s an uncomplicated camera and as long as the maximum aperture of f5.6 isn’t too restrictive, the huge frame size yields very high quality images. With a Fuji GSW, a small hand held meter and a few rolls of 400iso film, the entire package is smaller and less bulky than many dslr and even some mirrorless options when a few additional lenses are involved and it’s versatile enough to use for serious high quality tripod-mounted imaging as well as more fluid applications such as street and social documentary photography. The Fuji GSW690iii is a photographer’s camera that encourages you to go out and use it. Top. The lens aperture and shutter rings are accessed via slots at the sides of the lens body. 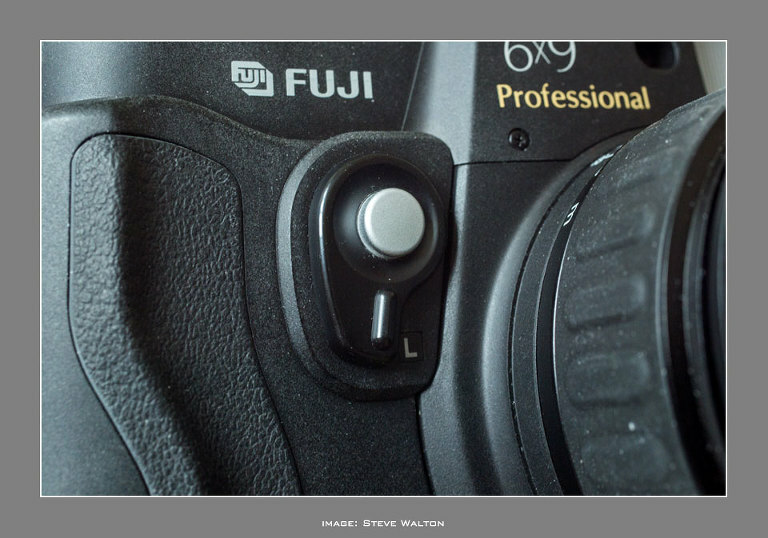 Front shutter release and lock. The lock operates on both the top and front release buttons. Base, showing standard tripod socket and ‘odometer’. Bubble level on the top plate only indicates lateral alignment. I use a shoe-mounted led cross level for correct leveling on a tripod. Luskentyre beach, Isle of Harris. Fuji GSW690iii, Kodak Portra 400. Luskentyre Beach, Isle of harris. Gasadalur, Faroe Islands. Fuji GSW690iii, Kodak Ektar 100. I’m sold—I’m bidding on eBay now. It’s a shame about the lack of filter functionality—didn’t realise this wouldn’t really work with the LEE system. Good point, thanks for including that. These images are incredible and very inspiring. Thank you for this article. I have been looking at one of these from a trusted store. It is $ 1000 and has 3200 clicks. This is a bit high compared to eBay pricing but at least I see it and I know the people there. it is in mint condition. Since I will use my digital for regular work and this for scenic shots I doubt I will break 5000 shots any time soon. Do you know if parts are still available for this camera? I wrote Fuji and they said no, but the answer was routed to their digital imaging group who may not know much about the camera. Presumably there is no film camera group left. So on the assumption that parts may be difficult to find, one idea is to buy one now and use as long as possible and possible buy a second one for parts, depending on how long film is still available. If the UK has places that still service them, it would be good to know. If there are any known faults of this camera (meaning things that fail prematurely) I would be grateful. Any chance you could upload a file of a landscape that I could magnify to see the resolution? Please put your watermark all over it ! I want it specifically for a few shots scenic shots that will be considerably enlarged. Your article is moving me closer to a purchase!